Following an open competitive process, Mutual Energy Limited and SGN were awarded licences by the Utility Regulator for Northern Ireland to build and operate the high pressure and low pressure gas pipelines which will extend the natural gas network into the west of Northern Ireland. 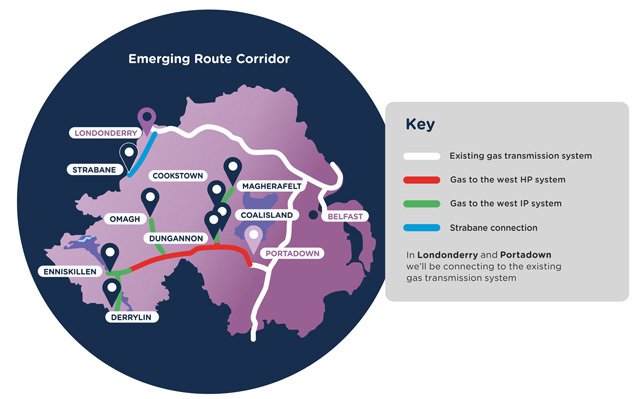 This significant gas network extension will bring the very considerable benefits of natural gas to the towns of Coalisland, Cookstown, Derrylin, Dungannon, Enniskillen, Magherafelt, Omagh and Strabane in the immediate years ahead. The first phase of the project saw the construction of a new gas pipeline to connect the Strabane area with the existing gas transmission network at Maydown, Derry/Londonderry, where a new pressure reduction station has been sited. The first industrial customer (LacPatrick at Artigarvan) has now been connected and the new distribution network continues to be rolled out in Strabane, with the first domestic customers now using gas in their homes. With full planning permission having been secured in mid 2017, the main works contractor for Gas to the West (Murphy GMC and Roadbridge) was appointed and the major construction phase of this £250 million infrastructure project got underway in October 2017. Murphy GMC and Roadbridge will be responsible for the specialist engineering and construction of 200km of gas pipelines in the Cookstown, Coalisland, Derrylin, Dungannon, Enniskillen, Magherafelt and Omagh areas. SGN Natural Gas is scheduled to deliver mains gas and meters to 40,000 customers over the next 40 years in eight main towns in the western area. The investment in Gas to the West will support around 200 jobs during the construction phase and the new gas infrastructure is expected to sustain a significant number of ongoing jobs for installation sub-contractors and other related functions. Gas to the West Stakeholders' Meeting Dungannon from Iain Webster on Vimeo. 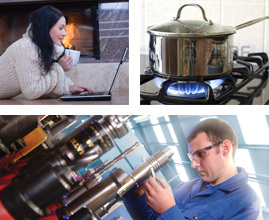 ﻿There are very significant benefits associated with the availability of gas in any particular area. The £250m investment in Gas to the West will support around 200 jobs during the construction phase. Thereafter the new gas infrastructure will sustain a significant number of ongoing jobs for installation sub-contractors and other related functions. VIDEO - Public information event underway in Enniskillen – come along and meet the team!